Reuilly is an appellation in the eastern Loire Valley. In 1935 Denis Jamain’s grandfather planted the first vines in the region along with farming the large oak forest on the edge of town. Denis continues in the family tradition of grape growing and farms seventeen hectares in the heart of the appellation, with eleven planted to Sauvignon Blanc, four planted to Pinot Noir, and two planted to Pinot Gris, which makes his superb and distinctive Reuilly rosé. The domaine received organic status in 2011. Pale vibrant yellow in the glass. Teh nose is ver y clean and fresh with pronounced green fruit, citrus white pepper and lily. 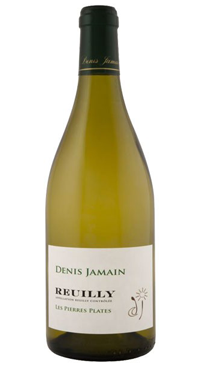 The palate is dry with lively acidity, lime pith and even a hint of peach. There is a pleasing mineral salinity that carries through to the finish. This wine would be perfect with ceviche, fish tacos and salads with fresh goat cheese. If you want to experience what I mean when I say minerality, notice the first impression on the palate, which is of fresh, cushiony, Sancerre-like Sauvignon Blanc. Then, immediately, there is a firmness, a stony firmness that appears from within the wine. Let’s call it Terroir to the Rescue, because a wine with nothing but pure fruit seems banal.